Beginning February 5, 2019 ladies will receive 15% off service each Tuesday at John Vance Auto Group dealerships. 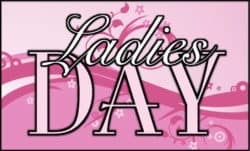 This means that each Tuesday is “Ladies Day” when all ladies will receive oil changes, tune-ups, repairs and other services minus 15% of the regular price. This offer cannot be combined with other offers and may not exceed $400 total. Beginning February 6, 2019 current military and first responders will receive 15% off service each Wednesday at John Vance Auto Group dealerships. This means that current military and first responders will receive oil changes, tune-ups, repairs and other services minus 15% of the regular price. This offer cannot be combined with other offers and may not exceed $400 total. Beginning February 1, 2019 seniors will receive 15% off service each Friday at John Vance Auto Group dealerships. (Must be 55 years of age or older) This means seniors receive oil changes, tune-ups, repairs and other services minus 15% of the regular price. 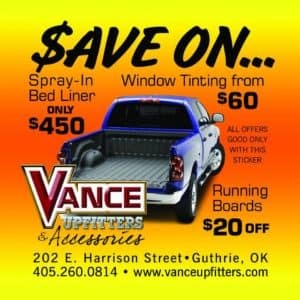 This offer cannot be combined with other offers and may not exceed $400 total. 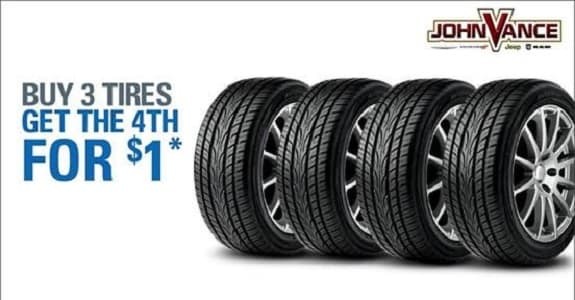 Buy 3 Tires and Get the 4th for $1! Available All August. Schedule a time for new tires today!